How does the Series Work and Why was it Created? Ronna’s peel series consists of six peels. The first sessions start at a lower percentage glycolic, working into higher percentage glycolic sessions. This is approximately a 6-8 week process. The first 5 can be done weekly, and that is ideal. However, should one need to miss a week or two, it will not jeopardize results. Often clients assume I have perfect skin. This is far from the truth. In my early twenties I had very large cystic acne. I visited a doctor and they wanted to put me on a strong antibiotic, that had awful side affects. I elected not to go on the antibiotic, and treat my skin with facials and diet. After the acne had subsided, I was left with numerous scars from where the blemishes had been. 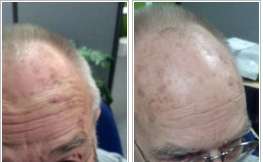 I sought help from an esthetician to remove the scars. It took a few peels, but there was very little resemblance left. Over the years different peels and percentages have come out, and I found that increasing them made it more effective. The purpose of the Glycolic is to remove dead skin from the surface layers of the skin. The peel treatments are able to focus on the more damaged areas of the skin including scars and aging spots and target them first, on a much deeper level. What is Glycolic acid? While being an acid your body naturally produces, glycolic acid (or hydroxyacetic acid) is the smallest α-hydroxy acid (AHA). This colorless, odorless, and hygroscopic crystalline solid is highly soluble in water. It is used in various skin-care products. Glycolic acid is also found in some sugar-crops. Consists of a mild peeling agent that can be used to lighten areas of hyperpigmentation and to treat aged sun damaged skin. Is excellent for all skin types. It smooths and rejuvenates skin, producing beautiful results in treating mild to severe acne, discoloration, moderate wrinkling, and sun damage. Peeling the face, neck, hands, and upper chest is also quite effective. Is very beneficial for patients with acne, oily, or thicker skin, because it tends to decrease oil production and open clogged sebaceous follicles. It also contributes to the healing process of acne. My series costs $350 if paid up front or $70 a session. The process begins the same as the glycolic, with a cleanse and prep for the process. 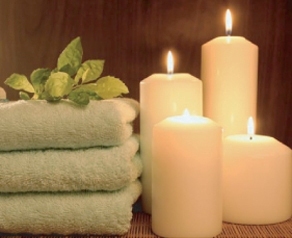 A scalp massage and hand/arm massage are also included. There is a small hand held fan to cool the face and accelerate the drying time of the layers of the peel. This peel has the ability to penetrate all the way to the dermis layer of skin. After being applied, a client will leave the peel on for 8 hours. The peel will automatically neutralize itself. The peel can be left on longer should one be asleep or not able to wash their face, because again, the peel will stop itself. When is a good time to do the Series? I do not recommend that people do the series when their sun exposure is going to be high. Your skin is a bit thinner and can be sensitive to sun. I prefer clients to do them during Fall or Spring. With Fall approaching, please look at timing, late September is best, so that peeling is done prior to holiday activities. Spring is best beginning in late February or early March. The procedure is simple. The skin will be cleansed and prepped, then the acid will be applied to face and neck. We can also apply to the chest for an additional cost. 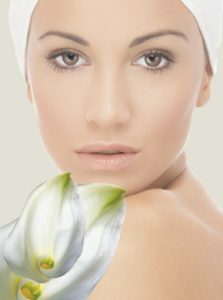 The peel will be left on for a duration of 5-11 minutes, depending on the skin’s reaction and client’s tolerance. A cool masque, custom designed to calm and sooth the skin, will follow, along with light massage. The masque will be removed and a moisturizing protectant will be applied. During the peel process, a scalp massage is also given to reduce tension, as well as a hand and arm massage. The down time with each peel varies. Usually the first session you are just generally pleased with skin and occasionally you may have a few dry spots that lightly peel, however, nothing overly significant occurs. With each session we increase the level, so session 2 and 3 (usually one of them is worse than the other, 50% of clients react to one, where the other half react to the opposite) you can expect some flaking and possibly some bubbling of the skin. This usually only lasts 2-3 days maximum. Session 4 usually reacts quickly, so just a day or two of irritation is common. Session 5 is our first Jessners peel. Many don’t react a lot the first day after, but the day after that is tough. Many of my clients elect to do this on a Thursday. Peeling can take anywhere from 3-9 days. The entire face will not take 9 days, however you could have certain areas that take that long. Although, eventually the entire face will peel. Because the peels are able to focus on the more damaged areas and target them first on a much deeper level, the results are softer, younger looking skin. Minimized sun spots/age spots, as well as wrinkles. The texture of the skin is also improved and the ability to absorb moisturizing products is dramatically increased. Follow up recommendations to maintain optimum results is to visit monthly. A different procedure will be applied at each visit, whether it be a facial, microdermabrasion or touch up peel. They will maintain the results and avoid future need of repeating peel process. 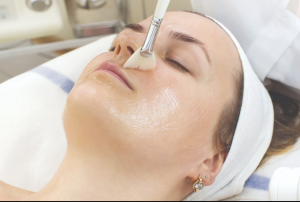 After the peel process is completed and the follow up facial is scheduled for a month out, the client will also be given the Signature facial a $95 value for the European facial price of $65.